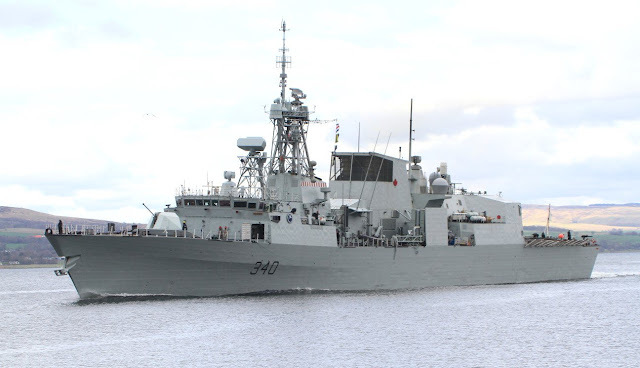 "Canadian Navy HMCS St John's FFH-340 passing Greenock outbound from Glasgow for Joint Warrior"
The Royal Canadian Navy deploy their fleet of Halifax-class frigates globally, but only some of their deployments are noticed and picked up on on the press. This isn't from the military's lack of trying; there are multiple cases where a story has been floated by DND's official social media accounts, but gets no press coverage. Thanks to the magic of AIS transponders, installed on the whole fleet, but only activated with the consent of the ship's command, we can skip all the middle management at DND and get the ships' coordinates directly from the the ship itself, over marine VHF (~162MHz), and the Automatic Identification System (AIS). To many people it seems concerning that we would be able to follow a military deployment with live location data, as it beacons every few minutes. Thankfully, Canada and NATO's adversaries don't rely on AIS to target or find Canadian ships worldwide. They know NATO procedures and understand in a time of conflict or operations the AIS transponder is set to receive only, turned off for our viewing, and will not transmit, so as to not give away their location either through ELINT, or reading the AIS data for free from MarineTraffic.com. Here are the twelve Halifax-class frigates of the Royal Canadian Navy, and the locations they last beaconed from using terrestrial based AIS (AIS-T) . Update 2018-06-27: I wasn't giving enough credit to the brave men and women and men who operate the Kingston-class coastal defence vessels of the Royal Canadian Navy, so I have included them on the dynamic map. BZ!